Reservations are now full for our Annual Vegan Holiday Event in Houston on December 12th, featuring a 4-course Vegan Dinner and a film presentation of "A Life Connected". Thanks to all who supported our Annual Vegan "Gentle Thanksgiving" Feast on November 21st! Our event was mentioned in the November issue of Change Magazine! Many thanks to our November event sponsors: Radical Eats and So Delicious! December 12, 2009: Society of PEACE Annual Holiday Vegan Dinner & Film Screening of "A Life Connected"
Join members of the Houston Health Association/Natural Hygiene Network this month for their Holiday Potluck Dinner. The event will begin at 5:30 PM on Saturday, December 5th at The Briar Room, and will feature a slideshow and door prizes. Please bring a vegan entree, side dish or salad to share for the potluck dinner. Society of PEACE member Dr. Mamiko Matsuda is the organizer of this group. Please visit Houston Health Association to learn more, or call Mamiko at 713-622-6051. The Vegetarian Society of the Bay Area is holding their annual Holiday Luncheon on Sunday, December 6th. This month, the group will host a special holiday event at The Village on the Lake, 19200 Space Center Blvd in Webster, TX. The event will begin at 12:30 pm and will feature a vegan potluck luncheon and door prizes. Join the Houston Vegan Raw Foods Lifestyle Meetup group and the Houston Raw Vegan Enthusiasts for a combined event this month, featuring John Rose. The groups will be having a raw vegan potluck dinner and presentation on Wednesday, December 9 at 6:30 PM. Please bring a raw vegan dish to share with the group. Note: newcomers need not bring a dish the first time -- just come and enjoy. The event begins promptly at 6:30 PM at the Taft Street Coffee House in Houston. The Houston Vegan Raw Food Lifestyle meetup group is organized by Houston chef Allie K. For more information and to RVSP online, visit the Houston Vegan Raw Foods Lifestyle Meetup. The Raw Vegan Enthusiasts group meets twice monthly - on the 2nd Wednesday & 4th Thursday of every month. For more information on their group, call the Taft Street Coffee House at 712-522-3533. 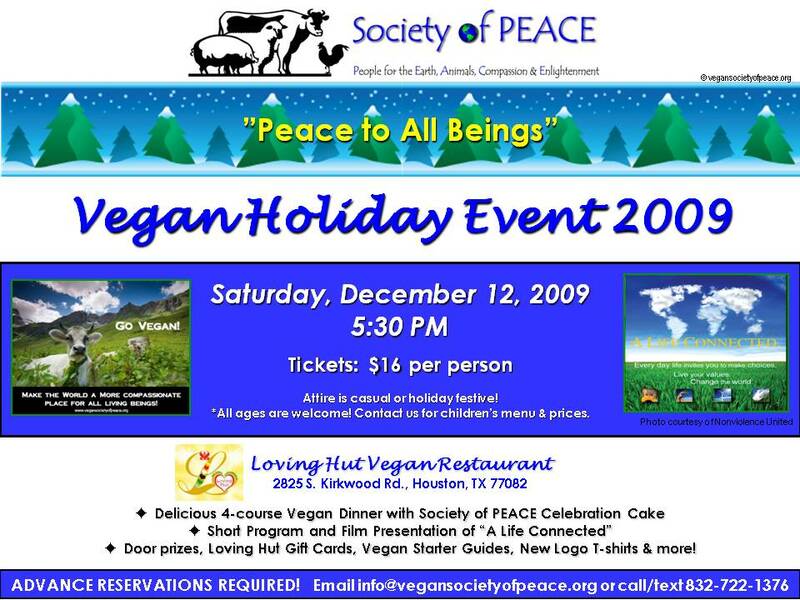 Society of PEACE Annual Vegan Holiday Dinner with Film Screening of "A Life Connected"
Join us on Saturday, December 12, 2009, for our Annual Vegan Society of PEACE Holiday Dinner Event! This year, our "Peace to All Beings" celebration event will be held at Houston's newest 100% vegan restaurant, Loving Hut. We'll feature a delicious 4-course vegan dinner with appetizers, soup, dinner variety plate, and a festive Society of PEACE Celebration Cake. We'll also have a special film presentation of "A Life Connected", as well as door prizes & Loving Hut gift cards! Plenty of Vegan Starter Guides & literature will be available, as will our new Society of PEACE logo T-shirts! All ages are welcome to attend. Loving Hut Vegan Restaurant is located at 2825 S. Kirkwood Road in Houston. For a map & directions, click here. Seating for our event begins at 5:30 PM, with dinner starting at 6:00 PM. The program and door prizes will follow. Ticket prices for the 4-course vegan dinner are just $16 per person and can be paid by cash, debit or credit card at the door. *For children under 10, please contact us for pricing & kids menu options. This event is open to our members and the general public! Reservations are required, as seating is limited! Attire is casual or holiday festive! Reservations are now full! All confirmed reservations have received notification via email or phone. If you don't have a reservation and wish to be placed on a waiting list, please email info@vegansocietyofpeace.org. We hope you'll join us for our "Peace for All Beings" Holiday celebration event in Houston! Please join us for our next Community Service Night as we help feed vegan meals to Houston's hungry! We'll be teaming up with volunteers from Houston's Food Not Bombs on Sunday, December 20, 2009 at 7:00 PM. Volunteers can bring vegan food to share and we will all enjoy a community meal together. We are also collecting blankets & non-perishable vegan snacks to hand out. If you can volunteer a few hours of your time, or wish to donate vegan food, snacks and/or blankets for our Community Service Night, please contact us. Volunteers should meet at 7:00 PM near the Library at Smith & McKinney. Arrangements for group carpooling can also be made. **Houston Food Not Bombs is always in need of food donations and volunteers. Meal sharing takes place every M,W,F at 8PM and SU at 7PM every week. Help Pure Mutts Animal Sanctuary make a Christmas miracle happen for animals in need. They have organized a service project to help abandoned animals at a local feed store. The project will take place from 8AM - 4PM on Thursday, December 24th. Many supplies are needed, as well as hardware, animal feed, blankets, etc. Volunteers will work to help rebuild shelter, clean the animals and help with a variety of tasks. For more information (including the location & directions), visit Pure Mutts Animal Sanctuary online, or email Priyanka Jorhi or Melanie Blake. Priyanka is also the director of Pure Mutts Animal Sanctuary and can be reached via phone at 832-277-3577. The Houston Hare Krishna Cultural Center is holding a Christmas Day Vegetarian Feast with Vegan options. The free veg feast will begin at 1:00 pm and is open to the general public and all ages are welcome. The Houston Hare Krishna Cultural Center is located at 1320 W. 34th Street in Houston. Directions can be found here. For more information, vistit ISKCON Houston online. Derived from a Swahili phrase meaning "first fruits" Kwanzaa is a cultural celebration of African heritage. Join the festivities as S.H.A.P.E. (Self-Helf for African People through Education) hosts the 6th evening in a series of Kwanzaa events in Houston. Also home to The Vegan Cafe ,the S.H.A.P.E. Community Center Family Building is located at 3815 Live Oak, Houston, TX 77004. The Celebration begins at the Kwanzaa Market Place at 5pm, with Opening Ceremony at 8pm. For more information, please call 713-521-0629 or 713-521-0641. You may also visit the Shape Community Center online.